Back cover blurb: On April 4, 1979, a Boeing 727 with 82 passengers and a crew of 7 rolled over and plummeted from an altitude of 39,000 feet to within seconds of crashing were it not for the crew's actions to save the plane. The cause of the unexplained dive was the subject of one of the longest NTSB investigations at that time. While the crew's efforts to save TWA 841 were initially hailed as heroic, that all changed when safety inspectors found twenty-one minutes of the thirty-minute cockpit voice recorder tape blank. The captain of the flight, Harvey “Hoot” Gibson, subsequently came under suspicion for deliberately erasing the tape in an effort to hide incriminating evidence. The voice recorder was never evaluated for any deficiencies. From that moment on, the investigation was focused on the crew to the exclusion of all other evidence. It was an investigation based on rumors, innuendos, and speculation. Eventually the NTSB, despite sworn testimony to the contrary, blamed the crew for the incident by having improperly manipulated the controls, leading to the dive. This is the story of an NTSB investigation gone awry and one pilot's decades-long battle to clear his name. Sometimes, I'm a little bit odd, and I like to read books, and TV shows and films about plane crashes... 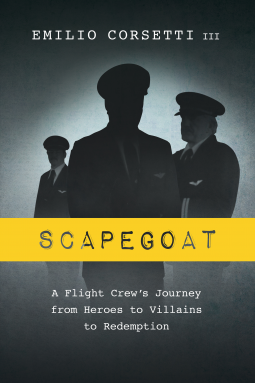 So when I saw Scapegoat on Netgalley, I knew I just had to read it... but I also had to watch 'The Plane That Fell From The Sky' first, to gain some background. TWA Flight 841 was a routine flight from John F. Kennedy airport, New York City to Minneapolis, Minnesota on 4 April 1979. The journey was quiet, uneventful, with one passenger even remarking how smooth it was at the back - a rarity on the aircraft type (a Boeing 727) due to the location of the engines. Sometime after the cabin crew had served the on board meal the plane suddenly began to roll to the right. The autopilot was disconnected immediately, for the Captain Harvey 'Hoot' Gibson to try and correct the roll and bring the aircraft back level. What followed was a terrifying incident for all on board. Not only could the crew not correct the roll, they were also seemingly unable to stop their aircraft entering a steep dive, inverting twice and beating the sound barrier. Eventually managing to bring their plane under control, the crew landed the plane safely in Detriot, Michegan and were portrayed as heroes for managing to put the aircraft down with no loss of life. But suddenly the crew's heroism and reputations, much like the plane itself began to spiral out of control as the NTSB investigation into the incident began to take place. This novel is an honest portrayal of events. It is full of facts and figures, but I believe these are all necessary if we are to make up our own minds about what really happened to Flight 841. Scapegoat is available from 1 August 2016.